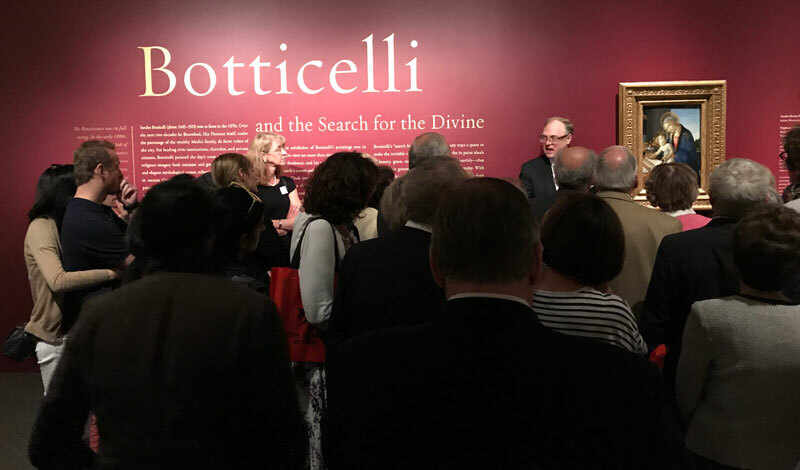 On the evening of Wednesday, June 7th, Boston Area members joined together at the Museum of Fine Arts for a special viewing of the exhibit, “Botticelli and the Search for the Divine” and a conversation with Frederich Illchman, Chair of the Art of Europe. This exhibit is considered to be the most celebrated and significant showing of Botticelli’s work in the United States. Botticelli and the Search for the Divine,” a stirring exhibition at the Museum of Fine Arts, traces the evolution of the early Renaissance master’s career. Its path is tender and rapturous, then dark, even angry, yet always visually lucid, always affecting. The exhibition contextualizes Botticelli’s development amid the creative hothouse of 15th-century Florence, and on through an immense societal upheaval in the 1490s. That’s when the great patrons of the arts, the Medici family, fell from power and the fire-and-brimstone preacher and canny political strategist Fra Girolamo Savonarola stepped into the void. The show, a terrific joint undertaking by the MFA and the Muscarelle Museum of Art at the College of William & Mary, is the largest Botticelli show yet in the United States, featuring 15 works by the master and several by those in his circle. Many have never been seen before this side of the Atlantic. This event provided a wonderful opportunity for members to come together as an Area and encounter the beautiful work of one of the greatest artists to have ever lived. A very special thank you to Board of Councillor member, Mark Kerwin, KM, and his wife, Annemarie for arranging and hosting this special night at the MFA.